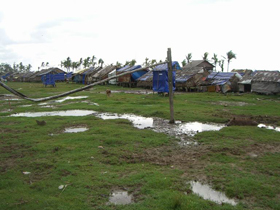 Cyclone Nargis struck the southern delta region of Myanmar on the 2nd and 3rd May 2008 and by the time the cyclone subsided more than 750,000 homes were damaged and destroyed. Nargis severely affected 2.4 million people, almost half of the total 4.7 million people living in the affected townships. An estimated 138,000 people were killed. An international aid response quickly followed and after brief initial resistance from the government, aid soon began to flow into Myanmar. Any natural disaster or complex emergency with widespread shelter damage automatically generates an international response from the Global Shelter Cluster (assuming the host government supports an international intervention). In the case of complex emergencies the responder will be UNHCR and for natural disasters the responder with be the IFRC and therefore the Nargis response was led by the IFRC. The emergency phase is defined as the first 3 months after which time the emergency responder hands-over coordination responsibility to an Early Recovery (ER) or development agency to coordinate the sustainable recovery activities. 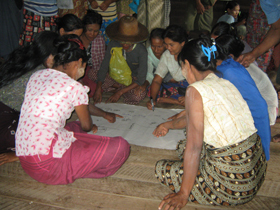 In Myanmar, UN-HABITAT came forward to lead the Shelter Cluster. Though UN-HABITAT was not present in Myanmar at the time of Nargis, a member of UN-HABITAT Genève-based disaster coordination staff was deployed to Myanmar within days of Nargis striking. This member of staff immediately developed a base for operations, recruited a small team and began liaising closely with government Ministries, IFRC, the UNCT, donors and other key agencies. To ensure equitable attention to the shelter needs through provision of technical standards, agreed guiding principles, and coherent implementation modalities that promote the principle of ‘Build Back Safer” and ‘Build Back Better’ and complement government interventions. Emergency and early recovery shelter data was collected, collated, analyzed on a monthly basis. Successful advocacy by UN-HABITAT contributed to significant additional funds being raised for shelter in the early part of 2009 and thus avoiding a crisis soon after the one year anniversary.